An assassin on the loose. A president in danger. Only one man stands between them. Over the years, Wolfgang Petersen established himself as one of the most consistent filmmakers on the scene. When you see him listed as a movie’s director, you’re virtually assured that the result will be a professional, fairly-compelling action flick. Unfortunately, you rarely get more than that. Although Petersen has produced few clunkers, he also has yet to make anything that rises above the level of “decent but unspectacular”. 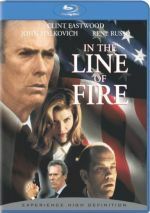 1993's In the Line of Fire exemplifies Petersen's strengths and weaknesses. It's an often exciting, fairly compelling movie. Seemingly, all the pieces are in place for this film to have been a really terrific experience. 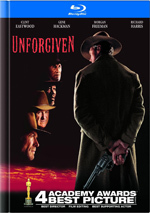 You have a great veteran cast, headlined by Clint Eastwood, fine production values, and a provocative plot. So why do I end up thinking that the movie is only pretty good at best? Veteran Secret Service Agent Frank Horrigan (Eastwood) finds himself pitted against a new foe. Mitch Leary (John Malkovich) threatens to kill the president, and he specifically toys with Horrigan, one of the agents on duty when Kennedy got shot. We follow this cat and mouse game as Horrigan tries to protect the president and capture Leary. While Petersen stages action sequences effectively, there seems to be a lack of passion behind his films, a kind of mechanical aspect to his direction that keeps these scenes from taking on any kind of real life of their own. Don't get me wrong - the action bits work well and they deliver some excitement. I just always feel vaguely unsatisfied after a Petersen movie, in a “total being less than the sum of its parts” way. Maybe I fault Petersen for the vague dryness of In the Line of Fire because I can't find anyone else to blame. The script by Jeff Maguire certainly provides a compelling twist on what could have been a fairly ordinary "stop the assassin" film. By making Eastwood's Horrigan a Secret Service member who was on duty when Kennedy got shot, the story adds an element of intrigue and emotional complexity that otherwise would not have existed. As such, we have a film in which the usual cat and mouse relationship between the pursuer and the pursued exists, but we also get some psychological aspects because of Horrigan's problematic past. I also like the fact that In the Line of Fire provides a nice portrayal of the difficulties faced by Secret Service agents. You have to protect the world's most powerful and famous person, someone whose job - especially during a campaign - requires him to be in very public places. I can't imagine what a nightmare all the logistics of that task must be, but the film gives us some idea. As far as the acting goes, Clint's Clint. He's almost completely beyond reproach in pretty much anything he does; the status of living legend will do that for you. That said, I think he seems pretty effective during In the Line of Fire. Certainly he knows how to play gruff and menacing, so that aspect of his performance isn't exactly a surprise. However, Eastwood also conveys the charm and magnetism of his character. In the end, Horrigan comes across as a real person much more clearly than do most of Eastwood's fairly one-dimensional characters; there's little about this performance that seems phony or contrived. Malkovich received an Oscar nomination for his role as psycho assassin Mitch Leary; he lost to Tommy Lee Jones for The Fugitive. Malkovich does creepy well, and In the Line of Fire finds him at his eerie best. Malkovich does what the role requires, as he makes Leary convincingly menacing, and does so with a style that seems unique to Malkovich. Malkovich and Eastwood help make In the Line of Fire a better than average thriller. In the Line of Fire appears in an aspect ratio of approximately 2.40:1 on this Blu-ray Disc. This was a decent transfer but not one that excelled. Sharpness was one of the inconsistent elements. While much of the movie showed reasonably good clarity and definition, occasional soft spots occurred, and the movie often showed a “smoothed out” look that robbed it of much detail. No issues with jagged edges or moiré effects popped up, and I saw no edge haloes. Print flaws also failed to mar the presentation. In terms of colors, the movie tended to be a little pale. The hues lacked much vivacity, and some of that reflected the source. Still, I thought the colors could’ve been livelier. Blacks were reasonably dark, and shadows seemed fairly clean. This was a watchable image but it felt lackluster. I was more pleased with the film’s pretty good Dolby TrueHD 5.1 soundtrack. The mix came from the “early days” of digital theater audio; Dolby Digital had only hit screens a year earlier, and 1993 marked the debuts of both DTS and SDDS. The latter format was used for In the Line of Fire, and that original mix has been nicely adapted for 5.1 use here. The soundfield started somewhat slowly but became more involving as the film progressed. The forward speakers displayed pretty good separation and created a nicely lively environment. Sounds moved acceptably clearly between channels and the entire picture seemed fairly accurate. The rears kicked in able reinforcement of the front imagery and added solid atmosphere of their own. Split-surround usage wasn’t frequent but when it did appear, it seemed well-utilized, such as when motorcades zoom past us. Audio quality appeared good. The film featured some obviously-looped dialogue on a number of occasions, but speech usually sounded relatively natural and distinct, with just a few signs of edginess. I heard no problems related to intelligibility. Effects were clean and realistic, with no distortion on display, and they seemed fairly rich and deep. Music came across as nicely bright and dynamic. The mix didn’t present any tremendous bass, but the low end seemed acceptably clean and tight. The soundtrack showed some age, but it still worked well nonetheless. As we head to the set’s extras, we find an audio commentary from director Wolfgang Petersen. As was the case for his track on The Perfect Storm, disc producer JM Kenny joins Petersen. Kenny adds a little information but generally functions as moderator/interviewer during this semi-screen specific track; at times Petersen addresses the on-screen action, but much of his talk goes off onto other issues. I’ve heard Petersen’s remarks for Das Boot, Air Force One and The Perfect Storm and found them to be decent but a little on the dull side. In many ways, this commentary resembles those others, especially during the not-too-scintillating first third or so, but it’s probably the best of the bunch. Apparently recorded during the making of Perfect Storm, Petersen tends to fall back on his favorite subjects: detailed technical information and praising participants. However, much of the time he gets into more compelling notes about the film such as tidbits gained from research for the movie and also some of the methods used to create certain scenes. I most like his statements about the ways the actors interacted, especially when he talks about the techniques used to get the best out of Eastwood. Petersen also provides a lot of information about his general filmmaking theories, all of which are stimulating to hear. Overall, I think this becomes a fairly compelling commentary that I enjoyed more than I expected; it’s a fairly typical piece from Petersen, but it’s still my favorite of his tracks. In the Deleted Scenes area, we find five snippets with a total running time of five minutes, one second. We locate “Piano Bar 1” (2:17), “Hat Joke” (0:42), “Miss Me?” (0:44), “Watching the News” (0:53) and “Piano Bar 2” (0:25). None of these are especially memorable, but I was happy to have a look at them nonetheless. A featurette called The Ultimate Sacrifice goes for 22 minutes, 14 seconds and offers a look back at the movie. We get comments from screenwriter Jeff Maguire, executive producer Gail Katz, technical advisor Bob Snow, US Secret Service Deputy Director Kevin Foley, USSS Field Agent Rebecca Ediger, USSS Assistant Director Larry Cockell, and actors Clint Eastwood, Dylan McDermott, and Rene Russo. We learn about the project’s roots and development, story/character areas, consulting with the Secret Service and related topics, cast and performances. Secret Service subjects dominate “Sacrifice” and add some interesting tidbits. The show tends to be fluffy and feels a little like an ad for the Secret Service, but it comes with enough good info to merit a look. More material about the Secret Service appears in Catching the Counterfeiters. This five-minute, 29-second featurette looks at that group’s less well-known task, and it provides a view of their tactics and techniques. We hear from Foley as well as USSS Counterfeit Department’s Lorelei W. Pagano and Daniel G. Snow. I like this brief history of attempts to battle counterfeiting, as it adds a nice touch of realism to the proceedings. The next featurette looks at the film’s special effects. How’d They Do That? takes four minutes, 54 seconds to cover some different methods in which computer generated material helped keep down film costs and add a sense of reality. We get notes from Mysteriously Unnamed Effects Guy. It’s a good presentation that was sufficient for the topic. The 19-minute and 57-second Behind the Scenes with the Secret Service comes from Showtime, and it offers a decent though somewhat insubstantial look at the movie. Hosted by Bob Snow, we find additional notes from Eastwood, Petersen, Katz, Russo, retired USSS Special Agent Jerry S. Parr, USSS Special Agents Gayle E. Moore and Carl Meyer, USSS Protective Operations Assistant Director Hubert T. Bell, producer Jeff Apple, Federal Law Enforcement Training Center director Charles F. Rinkevich, and actor John Malkovich. This show seems a bit redundant since we have a similar piece in “The Ultimate Sacrifice”. Like that show, k“Scenes” combines movie factoids with material about the real Secret Service, and though they complement each other fairly well, the Showtime program is the weaker of the two. Still, despite some repetition and sense of déjà vu, I still thought the show merited a look. The disc opens with ads for Vantage Point and Damages Season One. No trailer for Fire appears here. At this point, I’ve seen In the Line of Fire probably five times, and although I have enjoyed it to a moderate degree on each viewing, I continue to find it mildly disappointing. The film presents few overt flaws, but it seems vaguely unsatisfying and never rises to the level of true excitement or invention. 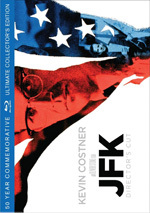 The Blu-ray offers good audio and bonus materials but picture quality seems lackluster. This ends up as a decent release for an entertaining but erratic movie.